“Zincotron,” the latest student designed CCNY vehicle to excel at AIChE's annual Chem-E-Car Competition®. CCNY's Che-E-Car team with some AIChE officials in Pittsburgh. 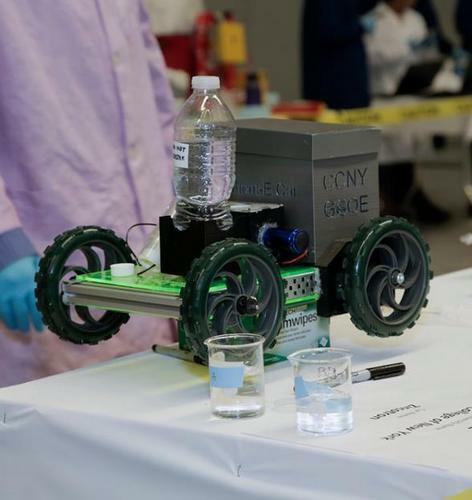 City College of New York’s student-designed “Zincotron” scored a double at AIChE's annual Chem-E-Car Competition®, taking third place against foreign and domestic opposition, and winning the Spirit of Competition Award for the fourth year running. Forty teams competed in the American Institute of Chemical Engineers finals at the David L. Lawrence Convention Center in, Pittsburgh, Pa.
Zincotron won AIChE's Mid-Atlantic competition last spring – City College’s third successive victory in that regional event – to qualify for the finals in Pittsburgh. The objective of the Chem-E-Car competition is for students to build a car, the size of a shoebox, which runs and stops at a precise distance via one or more chemical reactions. In Pittsburgh, cars were required to carry 390 ml of water over 25.3 meters, with the entry closest to the target distance being declared the winner. Zincotron was 0.120 m from the target line, the closest a CCNY car has achieved in competition. The winning team was Georgia Institute of Technology at 0.010 m (1.0 cm) from the target distance, and second was Rutgers University at 0.050 m away. “The competition was stiff this year, with eight teams reaching within 0.265 m from the target line. Several years ago this would have been sufficient for first or second place,” said Elizabeth Biddinger, assistant professor, chemical engineering, in the Grove School of Engineering, and the team’s faculty advisor. Fawaz Yusuff, junior, mechanical engineering. 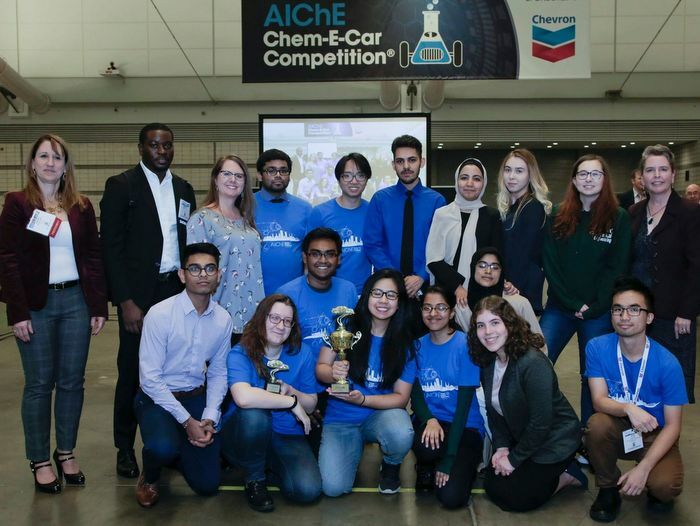 According to AIChE, the competition, which involves multiple regional competitions, increases awareness of the chemical engineering discipline among the public, industry leaders, educators, and other students. Significant support was provided to the team by the CCNY-based CUNY Energy Institute, the Grove School’s chemical engineering department, faculty and staff; the Metro NY AIChE section and Carl Liggio. Since 1847, The City College of New York has provided a high quality and affordable education to generations of New Yorkers in a wide variety of disciplines. CCNY embraces its role at the forefront of social change. It is ranked #1 by the Harvard-based Opportunity Insights out of 369 selective public colleges in the United States on the overall mobility index. This measure reflects both access and outcomes, representing the likelihood that a student at CCNY can move up two or more income quintiles. In addition, the Center for World University Rankings places CCNY in the top 1.2% of universities worldwide in terms of academic excellence. More than 16,000 students pursue undergraduate and graduate degrees in eight professional schools and divisions, driven by significant funded research, creativity and scholarship. CCNY is as diverse, dynamic and visionary as New York City itself. View CCNY Media Kit.